Tried fitting my 35w h7r Slim balast Canbus hid kit today but there is too much gubbins to cram into the light housing. I really don't want to drill a hole to put balast outside so I guess I need a smaller ballast kit. The current kit is too big mainly because f the extra Canbus box and wires and the Slim balast being a bit too chunky. Do I need a balast with the Canbus box? I can get a separate ultra Slim balast without an additional box so will fit in but will that throw up errors on my 99 996.1 without pcm? Should I get 35w or 55w? I wouldn't bother, all retro fit hid will fail an MOT from July according to new guidelines. I have 35w h7r in my car and they will be coming out. Shame as they work really well with a good bean pattern and no scatter. Yes, perhaps, but they take about 10 minutes to swop out if they are in the light housing so I'm prepared to do that once a year. Location: The land of the big cat! I also have a HID set up and it is all installed in the headlight using slimline ballasts and as my car has headlight washers and you cannot actually see the bulbs I wonder if they will pass the MOT with the new regulations but it is easy enough to swap back to good old really dim halogen bulbs. Current - Crystal White 40th Anniversary RX-8. Current - Porsche Carrera Cabriolet in Viola. Problem is the 996.1 has reflector not projector light units so an eagle eyed tester might still see it. You might get away with it with a 996.2 if the ballasts are hidden. Agreed the best bet is just to take them out once a year for the test! Stupid rule if you ask me, what they should test is the beam scatter. They just don`t keep pace with technology, the original H7 bulbs did not suit an open reflector but the shorter H7R stops scatter and gives the correct beam setting. You may be able to use them legally in the main beam position as they are not checked for a beam setting just that the lights will dip correctly. Does it need canbus, has 996.1 got any bulb out warning. 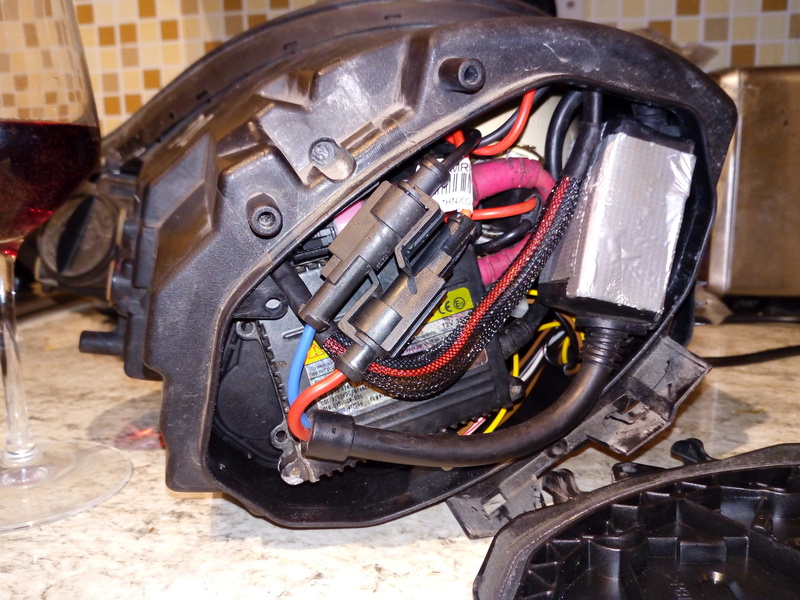 Really does take seconds to swap the light assemblies, what can you pick up some spare units for on eBay? That's what I'm trying to work out! I don't think it does require a Canbus canceller/resistor job but I only have the lights this weekend, I can't test it with no bulb in to find out. I have a '98 3.4 with a non canbus hid kit fitted and I get no bulb out warning errors at all, I fitted my ballasts to the wheel arch liner behind the headlight so it's all out of sight. To return the car to normal I'd only have to pop the headlight out remove the hid bulb and refit a h7 and move the original connector from the ballast to the bulb, the whole thing would take a few minutes at most. OK, found a smaller non Canbus ballast in the garage from a previous car which popped one ballast so replaced both leaving this spare. Yes it fits if you have a small enough ballast and no additional Canbus resistor box but by heck is it tight. The back cover fits on..Just.. but it's simply not sensible to shove all these gubbins in such a tight hot hole that's asking for trouble. I have resigned myself to drilling a hole and doing as chis and many others have and having the hot bits in the spacious cool wing.. I really like HIDs and they give so much more light over the standard candles in there. the idea of orange lights as spares come MOT time is a winner as they are cheap and so easy to fit!